In an adapted extract from, The Story of the Easter Rising, John Dorney describes the bloody fighting at Mount Street Bridge during the Easter Rising. In many locations during the Easter Rising, particularly at Jacobs Factory, the Four Courts and Bolands Mill, the Volunteers barely saw a British soldier all week. Rather their positions were isolated and bombarded from distance. Where, however, the British assaulted Volunteer positions dominating the routes into the city, fighting was much more bloody. There they were drawn into street fighting, with its invisible snipers and sudden close range cross-fires, which negated their superiority in men and firepower. This happened mainly at three locations, Mount Street Bridge, South Dublin Union/Marrowbone lane and North King Street. 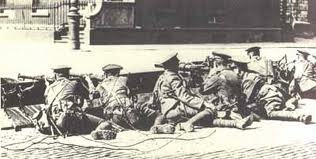 At Mount Street, on the approach to the city centre from the port at Kingstown (now Dun Laoghaire), a Volunteer outpost manned by only 17 men, armed with rifles and hand guns, faced the frontal assault of a battalion of British troops. 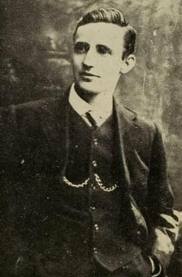 The rebels there, nominally under the command of Eamon de Valera in Bolands Mill, but under the direct control of Mick Malone, a twenty eight year old carpenter, had taken up their positions on Mount Street and Northumberland Road on Easter Monday, April 24. That day on Mount Street, a group of reserve volunteer soldiers, nicknamed in Dublin, the “Gorgeous Wrecks” (because of their advanced age and their tunics’ inscriptions ‘Georgius Rex’), unwittingly stumbled upon the rebel position and four were killed before they scrambled into safety at Beggars Bush barracks. Had the rebels known of the weakness of the British garrison, they could have taken Beggars Bush barracks (held initially by the army catering staff and 17 rifles) with relative ease. As it was they occupied the stately Clanwilliam House – commanding the crossing over the Grand Canal – and two houses on Northumberland road, an upper class, leafy, red-bricked neighbourhood. Although there was an alternative crossing of the canal available just a street away at Baggot Street, which would have flanked the Volunteers’ position, General Lowe ordered that the bridge at Mount street be taken “at all costs”. For the rest of the day, at the sound of whistles every twenty minutes, waves of hapless troops, led by officers with drawn swords, charged up the Road, only to be shot down. By the evening, the road was carpeted with dead and wounded British troops, many moaning in pain and trying feebly to drink from their water bottles. Mick Malone, who died fighting at number 25 Northumberland Road. The survivors crawled into the gutters and doorways at either side of the road for some cover, while others huddled under a low wall at the canal. For the Volunteers, despite the hopeless odds, it was exhilarating. Inside Clanwilliam House, two Volunteers, Patrick Doyle and Tom Walsh, shouted over the noise of battle, “Isn’t this a great day for Ireland?” “Isn’t it that?”, “Did I ever think I’d see a fight like this? Shouldn’t we all be grateful to the good God that he has allowed us to take part in a fight like this?”. No sooner were the words out of Doyle’s mouth when he was hit in the head and killed. De Valera, with over a hundred fighters, was only two streets away in Boland’s Mill, but his command never reinforced the Volunteers at Mount Street. Eventually, on the Thursday, the position was stormed when the British brought up machine guns and explosives. Four Volunteers, Malone among them were killed and another captured. The rest slipped away. The fighting at Mount Street had inflicted 240 casualties -or up to two thirds of British losses in Easter week. Not all of the Sherwood Foresters casualties were fatalities however. The Irish Times published the military’s official list of casualties on May 11, which listed 4 officers and 24 other ranks of the Sherwood Foresters killed, along with a much larger number, over 200, badly wounded . After the fighting, the area presented grisly sight, carpeted with British casualties. “They lay all over Northumberland Road, on the house steps, in the channels along the canal banks and in Warrington Place”, witnesses recalled, “the place was literally swimming with blood”. Four civilians had also been killed in the crossfire. The locals, “all of good class”, emerged from their homes to congratulate the British troops. There is something reminsicent of the western front about the British tactics at Mount Street. The same insistence on frontal assault would cost 20,000 British lives (many of them Ulstermen from the 36th Division) at the Somme on July 1st of that same year. For the rebels, it showed how much bloodier they might have made the Rising for the British Army had they made better use of small, well-sited outposts at key crossroads in the city, instead of cooping up hundreds of fighters in large buildings. For the surrender of the rebels at the end of the week, see here. Fearghal McGarry, The Rising, Ireland Easter 1916, p173. 26 Responses to "Today in Irish History, April 26, 1916, The battle at Mount Street Bridge"
Was he married to Sarah nee Connolly? Not sure if this was the same William O’Brien. Hello, my great grandmother was married to a William O’Brien that disappeared after 1915, I think he may be the same as yours. He was married to Sarah Connolly, does this name mean anything to you? According to my records, William had 2 brothers, Daniel and Thomas, and a sister Mary, known as Cissie. Was one of these your father? William’s mother was Mary, née Butler, and I am descended from her sister Annie. there is a William O’Brien who was in Bolands Mill Garrison, buried in Cahersiveen. him and his wife left for America after the Rising and then retired back to Kerry, where she was from. Tom Walsh of 27 Derryman Gardens, Bath Ave,Sandmount was one of the two surviving participants of this battle. He was 22 when he was in this battle with his brother Jimmy (17). He went on to marry and have a family in Dublin and died on 2nd December 1970. My mother lived on Baggot Street and often minded his children I was named after his daughter Aileen . My grandfather was Thomas Walsh. He went on to rear his four children on his own six weeks after the birth of his youngest daughter due to the death of his wife, my grandmother. She died from complications due to the birth. My father, the eldest will be 90 next year. He never spoke of his father’s experience in the rising but my grandfather was so proud of his medals and having served for freedom but he too never spoke about the death of his young brother Jim who died in combat. Thanks Catherine, but just to note that neither of those claims are in the article, only in the comments. I understand that Thomas and James may have come from western part of Co Waterford. I would love to hear more about them. Please contact me. Thank you. Hopefully one of his decendents might see this post as well! My grandfather, John Cooper was in the Gorgeous Georges, when they were returning to Beggar’s Bush Barracks on Easter Monday and shot at, as stated in the article. He was running towards the Barracks by the side of a walled in garden. The door in the wall was opened and he was pulled in! The people in the house managed to contact his family on the north side in Clontarf and two of his female cousins walked over to where my grandfather was. They bought an extra set of female clothes with them. He was then dressed in these clothes and the three of them walked back over to Clontarf. He never fully recovered from this incident and suffered from what they would now call PTSD! Interestingly, my father remembered playing in his back garden in Glasnevin and heard the gunshots from, probably the GPO. He asked his father what the noise was!